Depart the USA and Canada for Israel. Arrive in Israel late afternoon. Next stop, the City of the Great King - Jerusalem! Diner will be served at the hotels. After breakfast we will have our first day morning praise and worship with members of our ministry in Jerusalem followed by an orientation meeting. We will meet our tour leaders, leaders and members of the Ethiopian community, guides, local ministry, staff and each other. We start our day with a view of Jerusalem from the top the Mount of Olives - what a sight! 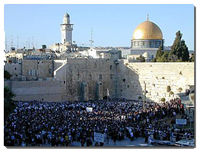 Here we will pause to recite the pilgrim's thanksgiving traditional blessings and pray for the peace of Jerusalem. 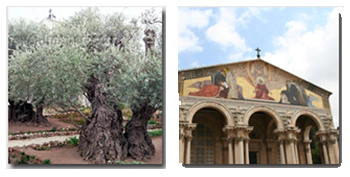 From the top of the mount of Olives we will follow the traditional path in the footsteps of Jesus to Gethsemane. Here we will experience a Kingdom Teaching and enjoy praise and worship. After the service in Gethsemane, participants are invited to an official visit the “Knesset” – The Israeli Parliament. Here we will be briefed by members of the House, these are the Ethiopian community Representatives members of the House that will address us. After the Knesset visit we will proceed to Mount Zion to visit the Upper Room and the traditional Tomb of King David. This afternoon we visit also the Southern Wall excavations. This southern side of the temple was the main entrance for the common folk, whereas the Priests and Levites had their own entrance from the higher eastern side. Parts of the giant stairs, which led to the Temple Mount from the courtyard have been unearthed along with the purification pools. From here Jesus entered the Temple Mount and drove out the vendors and money changers who were exploiting the people. It is also likely that this is the place that Peter stood and preached and where thousands were saved and baptized on the Day of Pentecost. We will start our day with a rare visit to an Ethiopian absorption center to enjoy a presentation by members of the Ethiopian community in Israel. Here we will see young and old learning to find their way in a modern environment. Here they learn Hebrew, they learn to read and write, run a modern household, handle money and pay bills, become productive and an integral part of society... All this while preserving their language, ancestral culture, costumes and holidays. After this fascinating introduction we will continue to the top of the Temple Mount! From here we will trace the footsteps of Jesus in His last day, visiting on the way the Pool of Bethesda, Stephen's Gate and St. Ann's Church and on to the Via Dolorosa, the way of the agony and the Stations of the Cross. We are reminded of His way of suffering along with a visit to the Church of the Holy Sepulcher. The old city bazaar will be our next stop. After a lunch break we will continue our visit to the Old City Jewish Quarter, Mount Zion and the Upper Room. This evening program is a high note, this will be a great gathering of unity, harmony and love all translated to music. Musicians from the Ethiopian community will perform with American musicians and Israelis. This will be a rhapsody in the colors of the rainbow!! Local leaders, pastors and the public are invited. We start our day with a visit to the Shrine of the book. This is the place where the Dead Sea scrolls are housed and are on display. Here we will also visit the incredible model of the City of Jerusalem as of the time of Jesus. On to picturesque Ein Karem, birthplace of John the Baptist before we continue to Bethlehem and Sheppard's Field, the traditional birthplace of Jesus Crist. Back to Jerusalem for the Shabbat (Sabbath) in Jerusalem. This evening we will partake in a most fervent “Kabalat Shabbat” service - the receiving of the Sabbath service at the Western Wall. Here we will mingle with thousands of Jerusalem Jews in praise & worship, this place is the only remnant of the temple atop Mt. Moriah. This is “a not to be missed event” where young and old worship in song and dance in a way most never experienced before. This will follow with a traditional Shabbat (Sabbath) Dinner with members of the Ethiopian community and our Jerusalem ministry friends. We will experience Masada, atop the mountain over-looking the sea below. Masada was the last pocket of insurrection in the Jewish rebellion against the Roman Empire where 960 men, women and children defied the might of Rome and fought for three years after the destruction of Jerusalem. 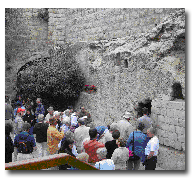 We will visit king Herod's Palace, the synagogue, and a very sophisticated water and irrigation systems 2000 years old. Later in the day a special treat awaits us as we go bathing in the heavy water of the Dead Sea. Then return to Jerusalem. Today we start our Galilean excursion. On our way we will visit the city of Netanya and another flourishing Ethiopian community. This is the hometown of Titi (Miss Israel) and her work here for the community youths is remarkable. On our way to Galilee, we will experience a praise and worship at the 2000 years old theater in ancient Caesarea. Here at Caesarea by the sea we will see the Crusaders' castle, the Roman amphitheater, and the seaport from which the Apostle Paul sailed to Rome. Continue along the coast to Mount Carmel to see the site of Elijah's triumph over the prophets of Baal. Here we will hear the biblical message and experience this magnificent site. 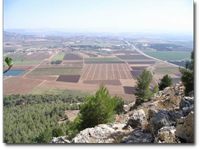 From here we continue to Megiddo on the Plain of Armageddon of latter day prophesies, we will see the remnants of the king Solomon's northern fortress's stables and its famous water supply system. We will continue to the Sea of Galilee for dinner and overnight. After docking at Ginosar, biblical Genesseret, we will visit the Primacy of Peter to see the area where Jesus asked Peter, Lovest thou me? Then we'll proceed to Capernaum to see the remains of an early church, the ruins of Peter's house, and the ancient synagogue. 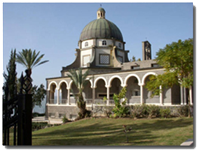 We will gather on the Mount of Beatitudes to read the Sermon on the Mount while overlooking the Sea of Galilee and have an on location teaching. We will also visit many of the places concerning the ministry of Jesus, including the place of the multiplication, waking on the water and much more. We will start our day with a visit the little town of Cana where Jesus turned the water into wine at the wedding feast, ready to renew you wedding vow here? We will have just the right pastor at hand... We continue west to one of the world’s most panoramic sites, a view of the entire city of Nazareth, the valley of Armageddon, Mount Tabor of the transfiguration and the Gilboa range. This great vista is from the top of Mt. Precipice - the cliff where Jesus was chased away and was about to be thrown to his death by the worshipers at the synagogue. From here we will drive trough the Valley of Sharon ascending to the City of the Great King – Jerusalem! Early morning we will start our program with a visit to the Yad Va'Shem, a museum built in memory of the six million Jews murdered by the Nazis in World War II and also a commemoration the righteous gentiles who by risking their own lives, rescued Jews from certain death. 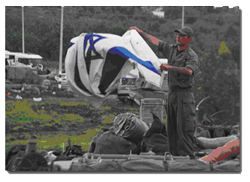 In accordance with biblical prophesies, Israel was reborn and just as in the days of Nehemiah, since her rebirth in 1948, Israel is in a continuous struggle for survival. More now, than ever before, Jewish soldiers, young Israeli, boys and girls, the "Shields of David” are the defenders of God's Land. To honor them, our special program today is in Latrun - the official Israel Defense Force Commemoration Center and armament display. Latrun is the fortress that was strategically built on Israel's main crossroads and throughout history protected the Holy City of Jerusalem. The program here will feature a full army ceremony including laying a wreath at the "Wall of Names" in honor of the fallen soldiers we pay tribute to the living. Here we will mingle with the young soldiers; we will be briefed by experts who will give us the opportunity to gain a better understanding and insight into the region's conflict. Here we will pray for the young hero’s of Israel - What a place to pledge our support and solidarity with their/our Godly plight. Jaffa (Joppa) will be our next visit before we return to Jerusalem to the tour's Grand Finale - A communion at the Garden Tomb! This is Golgotha - the site of Jesus empty tomb. What a great place to celebrate a communion, praise and worship and have time for devotion and prayers. We will return to the hotel for praise & worship followed by a farewell dinner. Some flights home will be during late evening, or early morning and transfers to the airport will be provided. Early morning transfers to the airport.